Here's a picture of me and Disharmony from practice last night. I was practicing jamming a lot, which is great because that's part of my goals for 2011. Oh, and notice I am wearing my *favorite* bright green HoTRD shirt. We got to scrimmage a bunch tonight, which is always fun and a great learning experience for our new girls who are up and coming. Disharmony, formerly Road Kill, is rostered for our next bout - woohoo! You might recall some of her fresh meat musings from this blog: a mini series called Meat Locker Missive. Snausage got a chuckle from our juxtaposition lined up on the jammer line together. Yeah yeah, same old story: I'm small, she's tall. 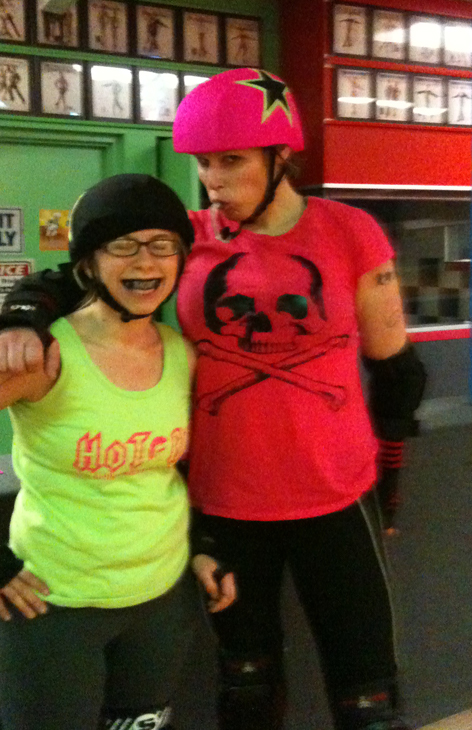 But I just wanted to capture this memory to look back 6 months from now when Disharmony's a killer skater and remember the fun scrimmages we had before her first bout.